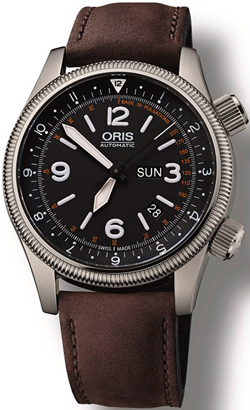 The famous watch brand Oris, noting the significance of the vital work “Royal Aviation Service» RFDS Australia, represents a novelty Oris Royal Flying Doctor Service Limited Edition (Ref. 7672 735 4084), which is issued in a limited edition – 2000 copies. Model dedicated to the public – a useful service activity RFDS, which provides aviation and primary health care across Australia. His work RFDS service beginning in 1928, but now it provides versatile air medical services in the world. RFDS fleet consists of 61 aircraft, 21 air medical base, 5-point and remote primary health care. For each year RFDS provides services to more than 14 thousands of clinics across Australia. In cooperation with the RFDS watch brand Oris has developed the Royal Flying Doctor Service Limited Edition. Printed orange paint scale on the dial is designed for doctors who use it to determine the pulse of the patient. Fixed by a threaded steel crown is placed at label 4, is designed for the factory mechanism and correction time, and a second head marks 2, decorated with embossed silhouette of the Australian mainland, is provided to set the second time zone. Housing news 44 mm made of stainless steel, the dial closes domed on both sides of sapphire crystal with anti-reflective coating, which improves the clarity of the dial. The back cover is established mineral glass with an imprinted logo RFDS, engraved inscription «Oris Royal Flying Doctor Service Limited Edition» engraved and numbered in a limited edition watch. The black dial features Arabic numerals and hour markers, as well as arrows with luminescent coating. Water Resistant – 100 meters. Equipped with automatic caliber watch Oris Caliber 735 (base mechanism – Sellita SW 220) with date (between labels “4” and “5:00”) and day (the label “3:00”). Complements novelty leather dark brown with a steel buckle or stainless steel bracelet with folding clasp. Buy watches Oris Royal Flying Doctor Service LE can be in a special gift box with a card on which are printed the phone numbers of local emergency services. Cost model – CHF 1750,00 (on a leather strap), CHF 1950,00 (on a bracelet).